Every once in a while, we find ourselves in a situation when we really want to decline somebody’s request or offer, but we don’t know how to do that. Especially when it comes to working relationship. The ability to say “no” at work can save your time and nerves. However, you need to do it in such a way that you don’t offend people you work with. 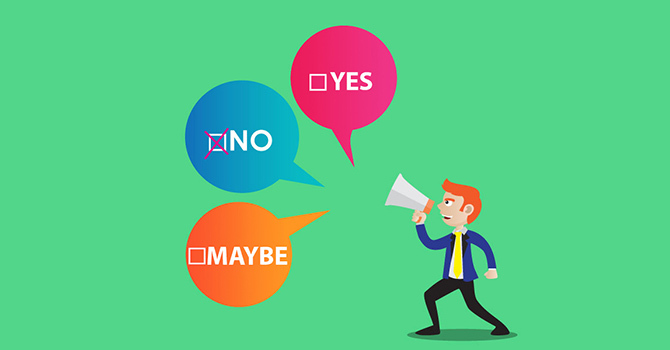 Here are three situations when you might want to say “no” and communication tips to solve these situations delicately. Let’s imagine that your manager asks you to take on some extra work, but you don’t want to do that because you already have too many other tasks to perform. Or you just want to be able to get home by 8 p.m. and spend some quality time with your family or friends. So what do you do? Well, you have to be really diplomatic here because you don’t want to be out of new interesting projects or even to lose your job. So, don’t just say a straightforward “no” and don’t blame your manager for overloading you with tasks. Say that you are delighted that they want to entrust such a responsibility to you, but also mention that you would like to spend some time on your previous tasks. Thus, your manager will either postpone the tasks they gave you earlier so you could take on a new project or make somebody else responsible for it. Saying “no” to your fellow worker is also a risky thing, since you might also need their help sometimes. So, you might want to consider helping them if you can. In such a way, you can build better relationships with your co-workers. However, if you’re short of time or have some other strong reasons to decline, try to explain your colleagues why you can’t help them. Never come up with fake excuses like some tasks or personal plans, which you don’t really have, because the truth will come to light in the end. Instead, help your colleagues understand why you are not suitable for the task they ask you to perform. When you feel the need to say “no” to your clients, always provide them reasons for that. When you discuss some issues of your project, don’t cut off their suggestions blatantly, just because you are a professional and they are not. Let them show you how they see certain things and then explain in details why your approach is better. If you explain them why exactly they are not good enough for your project, they might give up on it. All in all, remember that, while being absolutely essential in some situations, declining all the offers and requests at work might harm your professional reputation. So, be moderate about it and do it diplomatically. Someday, you might find this career advice very useful.